view of the skull of Andalgalornis steuletti. 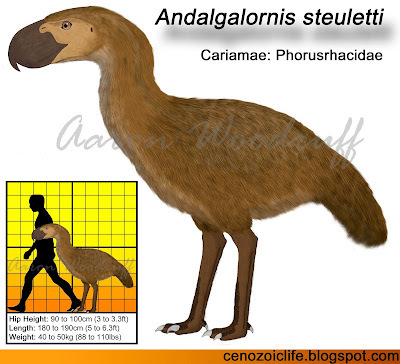 Steulett’s Terror Bird (Andalgalornis steuletti) is a mid-sized terror bird (Phorusrhacidae) from the late Miocene and early Pliocene. It ranks as one of the deadliest predators of its time, armed with speed, agility, and a guillotine-like beak. 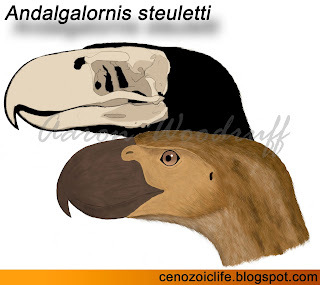 Steulett’s Terror Bird lived during the upper Miocene to lower Pliocene of South America. Its remains are currently known only from Argentina, which was covered primarily by grassland and open woodland at the time. This species is known from a partial skeleton as well as isolated bones. Steulett’s Terror Bird was roughly the size of a Greater Rhea (Rhea americana) but was more robust, weighing perhaps 40 to 50kg compared to 35kg for the average adult male rhea. It stood 90 to 100cm high at the level of the back and could raise its head to about 140cm above the ground, or about the height of the average 12 year-old. Overall, Steulett’s Terror Bird was more powerfully built in proportion to other terror birds. 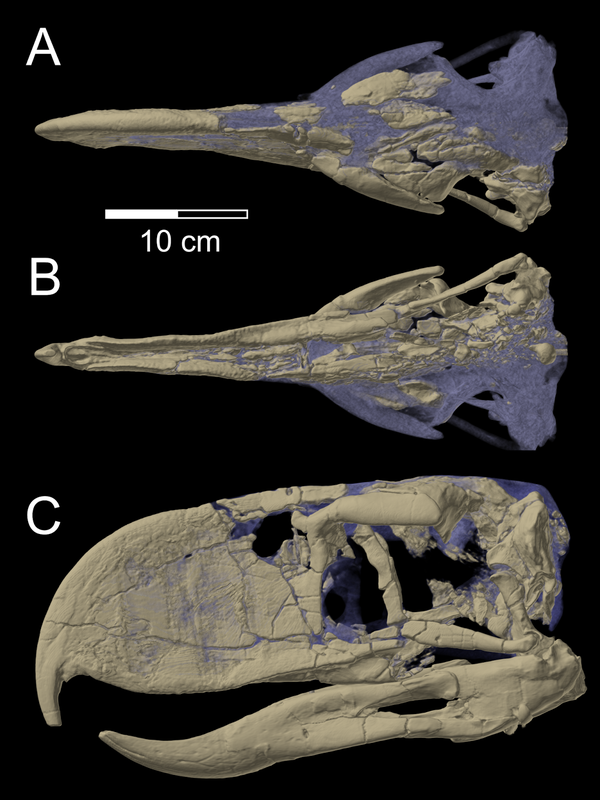 Its 37cm skull in particular had a viciously hooked beak which was very tall, somewhat blade-like, and capable of withstanding considerable forces. This suggests that these animals were able to handle relatively large prey items, perhaps even larger than themselves. Detailed studies of the neck vertebrae have been performed which suggest that the neck of Steulett’s Terror Bird would have been held in an S-shaped position while at rest and was adapted for rapid and powerful movements in the sagittal plane*, an ideal motion for striking prey. Although it has traditionally been thought of as a hunter of small prey, the reinforced skull and blade-like beak of Steulett’s Terror Bird was built to withstand the considerable stresses involved in bringing down animals of considerable sizes. Potential prey items included a broad range of small to relatively large mammalian herbivores like hegetotheres* and cavimorph rodents, as well as many of the smaller toxodonts*, machraucheniids*, and ground sloths with which it coexisted. Whether it hunted singly or in small social groups is unknown, but regardless of its hunting method Steulett’s Terror Bird was undoubtedly one of the top predators of its time. Competing predators included several sparassodonts*, including the Marsupial Sabertooth (Thylacosmilus atrox), and at least four other species of terror bird, including smaller Scaglia’s Terror Bird (Llallawavis scagliai). Hegetothere: an extinct family of small, rabbit-like ungulates endemic to South America. Macrauucheniid: an extinct family of small to large, long-necked ungulates endemic to South America. Sagittal plane: the vertical plane which separates the body into right and left halves. Sparassodonta: an extinct order of predatory mammals endemic to South America from the Paleocene to the Pliocene. Toxodont: an extinct family of sheep to bison-sized ungulates endemic to South America until the Pleistocene.